Reading to your baby can bring many benefits. Not only is it an excellent way to bond with your little one, but it can also really aid in their development. Did you know for example, that the first few months of your baby’s life are the most important in terms of language development? Their little brain starts to organize itself based upon the experiences baby has with language. If you don’t talk to your little one, they aren’t going to learn much in terms of language, so reading is pretty much an essential activity you should always make time for. However, reading to a baby isn’t always easy. You can find yourself questioning just how much they understand. It can feel awkward when you know baby can’t talk or really respond much to what you’re saying. However, while it may be difficult to tell, reading to your baby is having a wonderful effect on their development and bond with you. 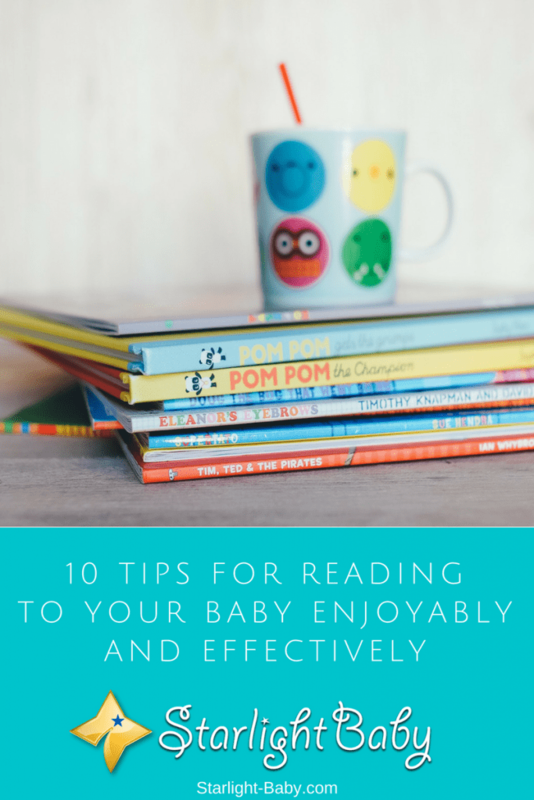 If you’re struggling to read to your baby, here you’ll discover 10 great tips that can help. Both you and baby should be comfortable and relaxed when it comes to Storytime. So, start by snuggling up on the sofa together, or in a rocking chair. Ensure you’re both warm and comfortable before you begin. If you aren’t, neither you or your baby will be fully focused on the book you’re reading. The main thing that’s going to help baby stay interested in the story is your expressions and tone of voice. This is one of the main things parents struggle with as it can feel really awkward at first. During certain parts of the story, change your facial expressions and match what is happening with an appropriate tone. For example, if a character in the story is surprised, let out a gasp. If they get excited, bounce little one on your knee and use a more excitable tone. Babies LOVE over-the-top expressions. It perks their interest and makes them laugh. You can also point to things in the book as you read about them to give baby a basic idea of what is happening. They may not fully understand, but it does help them develop some connection to the story. Always look for your baby’s responses as you read. If, after you finish a page, you notice they seem transfixed on it, don’t be so quick to turn over. Let them absorb the pictures and the words. Babies have very short attention spans so you need to take advantage of the times where they are fully focused on what you’re reading. Similarly, if they start to fuss and look around, that’s a sure sign that you need to put the book down for a while. Forcing them to try and stay focused on reading will not only lead to a fit of crying, but it will also cause them to see reading as a negative thing. There are a lot of baby books out there and some are much better than others for capturing your little one’s attention. Books that baby can hold and read by themselves are the best option. Also, look out for fabric based books as these are ideal for babies who are going through the chewing phase. Thick board-style books are also sturdy enough to put up with baby wear and tear. Paperback books on the other hand, should be avoided until your little one is old enough not to try and tear them. Finally, touch and feel books can also help engage more of your baby’s senses. It’s important to ensure you’re reading to your baby at the right times. If you try and read a book when they’re overly tired for example, they aren’t going to want to just lay there and listen. Similarly, if baby is due to be fed soon, they’ll be less likely to concentrate on reading. The best times to read to your little one is typically either just after dinner, or after bath time. It can also work well just after their afternoon nap. A clever tip to help ensure baby is focused on the task in hand, is to give them small, healthy snacks. You’ll find when they’re nibbling on something, they tend to pay much more attention to the book and will be more likely to sit there quietly and contentedly. You’ll often notice as you’re reading, your baby starts to make little sounds. Gurgles, growls and coos are all signs your little one is trying to communicate with you. It’s also a very important first step towards speech development. If they’re making sounds as you read, it’s a sure sign they’re paying attention. So, encourage them to make sounds and don’t be afraid to make your own. You can enhance baby’s reading skills all throughout the day. When you head to the grocery store, talk to them about the foods you are selecting and describe the things around you. You don’t need to have words and pictures on a page to read to your little one. The more you talk to them and show them things throughout the day, the more they’ll discover about how language works. Ok, so technically just looking at pictures together isn’t classed as “reading”. However, babies often find it more fun to look at and talk about the pictures they see. Many baby books are packed full of beautiful illustrations which babies find fascinating. They can learn just as much from looking and talking about the pictures at this age, than they will reading along to the words. As babies do have a very short attention span, it’s important to keep reading sessions short too. If you try to read to your little one for an hour for example, you’re likely going to encounter quite a few problems! So, keep sessions as short as possible to start and you’ll soon find as they get a little older, they’ll want to read for longer periods of time. Overall, reading to your baby is really important both for bonding and for aiding in their development. The tips above will help you to get started and get the most out of your sessions. Do you have any tips of your own? Share them with us below! I’m not afraid to admit this but I was one of those mother’s that were actually scared to read to their children because I never read in an expressive manner before. I was terrified of doing it in front of my child – silly I know now. I just knew that I wanted the baby to enjoy as much as possible and I knew how important intonation and over acting is. If I would just read like I read to myself then he wouldn’t be interested in it. Luckily, I have an amazing partner that helped me through my ”fear” and let me practice on him so I’ve beaten the stupid and irrational sacredness of reading out loud. I was so happy after our first reading session with my little boy. Especially, when I saw how much he enjoyed and smiled during. He loved interacting with me and the book (it had pictures). It made him fall asleep much easier. To all the future moms: don’t be scared to overact and be a bit ”silly” during reading time. Nothing wrong with that Jane! You’ve really got to put your acting skills to the test sometimes when it comes to parenting.. and that is just as true with reading as it is with everything else. It can be really fun to act silly so long as you’re willing to let loose a bit. Admittedly, I still struggle a bit when there are other adults are around – it’s a lot easier when it’s just the child around, the fear of judgement or whatever goes away a lot easier it seems. Appreciate you sharing your story and it’s wonderful to hear that your partner was able to help you through that! It is too early to read to our five months old baby, however, I understand the importance of reading aloud to babies. When you read aloud to the babies, you will help his learning process. Currently, I am using videos to help my child understand things.